As medical centres become more sophisticated with not only doctor consultation rooms but also with pathology, xray or minor surgery departments, it is now standard for all medical centres and private surgery clinics to install a reliable CCTV surveillance solution. For medium to large sized medical centres, private surgery clinics or even hospitals, patient security and surveillance is crucial when it comes to monitoring constant people traffic as well as potential hazards or negligible accidents that may occur within the medical centre that cannot be monitored all the time by the receptionist staff. At Serious Security, we understand that while you may have 1 – 3 staff manning the receptionist desk, they are usually seated away from the patients and are usually pre-occupied with administration paperwork or other receptionist duties. This means that your receptionist team may not be completely attentive to your patients or your surroundings. Installing the right security equipment will allow complete monitoring of patient activities as well as any negligible circumstances that may require CCTV footage for evidence. 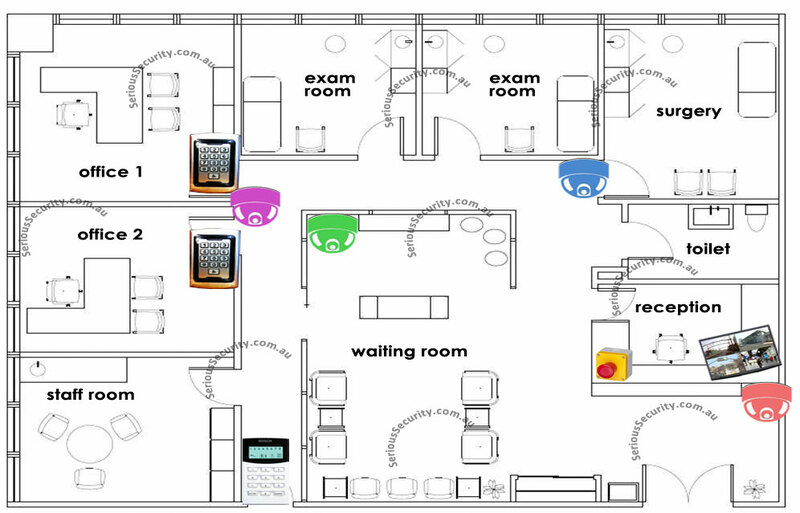 Below is a simple medical centre floor plan of how most clinics choose to set up their security equipment. For hospitals or private surgery clinics, please contact our team for custom quoting on your requirements. An analog CCTV system is usually quite sufficient in helping receptionist staff and doctors to monitor the patient area and other hallway areas. This will allow enough resolution to monitor incoming and outgoing patient traffic as well as recognise facial features. However, if you feel your clinic requires more clarity in capturing detailed descriptions on camera, you will need to upgrade to our high definition IP network camera system. Other CCTV cameras will be positioned outside other main departments such as outside the pathology waiting area, long hallways, back office areas, etc that is away from the reception desk view span. This will allow better control by all medical centre staff to be able to see activities of patients other than the environment they see right in front of them. Depending on the size of your waiting room area, usually 1 CCTV camera is sufficient in monitoring the entire area. Upon understanding your requirements and security concerns, the technician will recommend camera positions that is best suited to your clinic. Some medical centres have a few designated rooms that allow only permitted personnel staff entering such as rooms with confidential documents, medical supply rooms, senior management offices, etc. A stand alone access control pad will allow only medical centre staff on entering these vicinities.